This article is about the philosophy, economic theory and history of Social Credit. Social Credit originated from the writings of C. H. Douglas (1879–1952), a British engineer, who wrote a book by that name in 1924. Social Credit is described by Douglas as “the policy of a philosophy“; he called his philosophy “Practical Christianity”. According to Douglas, the true purpose of production is consumption, and production must serve the genuine, freely expressed interests of consumers. Each citizen is to have a beneficial, not direct, inheritance in the communal capital conferred by complete and dynamic access to the fruits of industry assured by the National Dividend and Compensated Price. Consumers, fully provided with adequate purchasing power, will establish the policy of production through exercise of their monetary vote. The policy proposals of Social Credit attracted widespread interest in the decades between the world wars of the twentieth century because of their relevance to economic conditions of the time. Douglas called attention to the excess of production capacity over consumer purchasing power, an observation that was also made by John Maynard Keynes in his book, The General Theory of Employment, Interest and Money. While Douglas shared some of Keynes’ criticisms of the monetary and banking systems, his unique remedies were disputed and even rejected by most economists and bankers of the time. Remnants of Social Credit still exist within Social Credit parties throughout the world, but not in the purest form originally advanced by Major C. H. Douglas. Likewise, the Keynesian Revolution of the 1940s and 1950s was eventually eroded by neoclassical economists and banking interests. Now as Keynes’ ideas seem the most generally accepted response to the Financial crisis of 2007–2010, modern analysts like Richard C. Cook argue the need for a renewed interest in the long dormant ideas of Major Douglas. Closely associated with the concept of our cultural inheritance is the Social Credit theory of economic sabotage. While Douglas believed the cultural heritage factor of production is primary in increasing wealth, he also believed that economic sabotage is the primary factor decreasing it. The word wealth derives from the Old English word wela, or “well-being”, and Douglas believed that all production should increase personal well-being. Therefore, production that does not directly increase personal well-being is waste, or economic sabotage. By modern methods of accounting, the consumer is forced to pay for all the costs of production, including waste. The economic effect of charging the consumer with all waste in industry is that the consumer is forced to do much more work than is necessary. Douglas believed that wasted effort could be directly linked to confusion in regards to the purpose of the economic system, and the belief that the economic system exists to provide employment in order to distribute income. “1. The first of these is that it is a disguised Government, of which the primary, though admittedly not the only, object is to impose upon the world a system of thought and action. 2. The second alternative has a certain similarity to the first, but is simpler. It assumes that the primary objective of the industrial system is the provision of employment. Douglas believed that it was the third policy alternative upon which an industrial system should be based, but confusion of thought has allowed the industrial system to be governed by the first two objectives. If the purpose of our economic system is to deliver the maximum amount of goods and services with the least amount of effort, then the ability to deliver goods and services with the least amount of employment is actually desirable. Douglas proposed that unemployment is a logical consequence of machines replacing labour in the productive process, and any attempt to reverse this process through policies designed to attain full employment directly sabotages our cultural inheritance. Douglas also believed that the people displaced from the industrial system through the process of mechanization should still have the ability to consume the fruits of the system, because he suggested that we are all inheritors of the cultural inheritance, and his proposal for a national dividend is directly related to this belief. Douglas criticized classical economics because it was based upon a barter economy, whereas the modern economy is a monetary one. To the classical economist, money is a medium of exchange. Douglas argued that this may have once been the case when the majority of wealth was produced by individuals who subsequently exchanged it with each other. But in modern economies, division of labour splits production into multiple processes, and wealth is produced by people working in association with each other. For instance, an automobile worker does not produce any wealth (i.e., the automobile) by himself, but only in conjunction with other auto workers, the producers of roads, gasoline, insurance, etc. In this view, wealth is a pool upon which people can draw, and the efficiency gained by individuals cooperating in the productive process is known as the “unearned increment of association” – historic accumulations of which constitute what Douglas called the cultural heritage. The means of drawing upon this pool are the tickets distributed by the banking system. Douglas believed that money should not be regarded as a commodity but rather as a ticket, a means of distribution of production. “There are two sides to this question of a ticket representing something that we can call, if we like, a value. There is the ticket itself – the money which forms the thing we call ‘effective demand‘ – and there is something we call a price opposite to it.” Money is effective demand, and the means of reclaiming that money are prices and taxes. As real capital replaces labour in the process of modernization, money should become increasingly an instrument of distribution. Douglas also claimed the problem of production, or scarcity, had long been solved. The new problem was one of distribution. However; so long as orthodox economics makes scarcity a value, banks will continue to believe that they are creating value for the money they produce by making it scarce. Douglas criticized the banking system on two counts: for being a form of government which has been centralizing its power for centuries, and for claiming ownership to the money they create. Group A – All payments made to individuals (wages, salaries, and dividends). Group B – All payments made to other organizations (raw materials, bank charges, and other external costs). According to Douglas, the major consequence of the problem is exponentially increasing debt. Further, he believed that society is forced to produce goods that consumers either do not want or cannot afford to purchase (i.e., economic sabotage). The latter represents a favorable balance of trade, meaning a country exports more than it imports. But not every country can pursue this objective at the same time, as one country must import more than it exports when another country exports more than it imports. Douglas proposed that the long-term consequence of this policy is a trade war, typically resulting in real war – hence, the Social Credit admonition, “He who calls for Full-Employment calls for War!”, expressed by the Social Credit Party of Great Britain and Northern Ireland, led by John Hargrave. The former represents excessive capital production and/or military build-up. Douglas believed that excessive capital production is only a temporary correction, because the cost of the capital appears in the cost of consumer goods, or taxes, which will further exacerbate future gaps between income and prices. Military buildup necessitates either the violent use of weapons or a superfluous accumulation of them. If overhead charges (B) are constantly increasing relative to income (A), any attempt to stabilize or increase income is met with rising prices. If income (A) is constant or increasing, and overhead charges (B) are continuously increasing due to technological advancement, then prices (A+B) must also increase. Further, any attempt to stabilize or decrease prices (A+B) must be met by falling incomes according to this analysis. Douglas suggested that this is the reason why deflation is regarded as a problem in orthodox economics. As the Phillips Curve suggests, inflation and unemployment are trade-offs, unless prices are reduced from monies derived from outside the productive system. According to Douglas’ A+B theorem, the systemic problem of rising prices, or inflation, is not “too much money chasing too few goods”, but is the increasing rate of overhead charges in production due to the mechanization of industry. Douglas did not suggest that inflation cannot be caused by too much money chasing too few consumer goods, but according to his analysis this is not the only cause of inflation, and that inflation is systemic under the orthodox rules of cost accountancy, even if there is not enough purchasing power in existence to liquidate all the costs of production. Douglas proposed to eliminate the gap between purchasing power and prices by increasing consumer purchasing power with credits which do not appear in prices in the form of a price rebate and a dividend. Formally called a “Compensated Price” and a “National (or Consumer) Dividend”, a National Credit Office would be charged with the task of calculating the size of the rebate and dividend by determining a national balance sheet, and calculating aggregate production and consumption statistics. The physical cost of producing something is the materials and capital that were consumed in its production, plus that amount of consumer goods labour consumed during its production. This total consumption represents the physical, or real, cost of production. Since fewer inputs are consumed to produce a unit of output with every improvement in process, the real cost of production falls over time. As a result, prices should also fall with the progression of time. “As society’s capacity to deliver goods and services is increased by the use of plant and still more by scientific progress, and decreased by the production, maintenance, or depreciation of it, we can issue credit, in costs, at a greater rate than the rate at which we take it back through prices of ultimate products, if capacity to supply individuals exceeds desire.”. Incomes are paid to workers during a multi-stage program of production. According to the convention of accepted orthodox rules of accountancy, those incomes are part of the financial cost and price of the final product. For the product to be purchased with incomes earned in respect of its manufacture, all of these incomes would have to be saved until the product’s completion. Douglas argued that incomes are typically spent on past production to meet the present needs of living, and will not be available to purchase goods completed in the future—goods which must include the sum of incomes paid out during their period of manufacture in their price. Consequently, this does not liquidate the financial cost of production inasmuch as it merely passes charges of one accountancy period on as mounting charges against future periods. In other words, according to Douglas, supply does not create enough demand to liquidate all the costs of production. Douglas denied the validity of Say’s Law in economics. C.H. Douglas defined democracy as the “will of the people”, not rule by the majority, suggesting that Social Credit could be implemented by any political party supported by effective public demand. Once implemented to achieve a realistic integration of means and ends, party politics would cease to exist. Traditional ballot box democracy is incompatible with Social Credit, which assumes the right of individuals to choose freely one thing at a time, and to contract out of unsatisfactory associations. Douglas advocated what he called the “responsible vote”, where anonymity in the voting process would no longer exist. “The individual voter must be made individually responsible, not collectively taxable, for his vote.” Douglas believed that party politics should be replaced by a “union of electors” in which the only role of an elected official would be to implement the popular will. Douglas believed that the implemenation of such a system was necessary as otherwise the government would be the tool of international financiers. Douglas also opposed the secret ballot arguing that it led to electoral irresponsibility, calling it a “Jewish” technique used to ensure Barabbas was freed leaving Christ to be crucified. C.H. Douglas was a civil engineer who pursued his higher education at Cambridge University. His early writings appeared most notably in the British intellectual journal The New Age. The editor of that publication, Alfred Orage, devoted The New Age and later The New English Weekly to the promulgation of Douglas’s ideas until his death on the eve of his BBC speech on Social Credit, November 5, 1934, in the Poverty in Plenty Series. 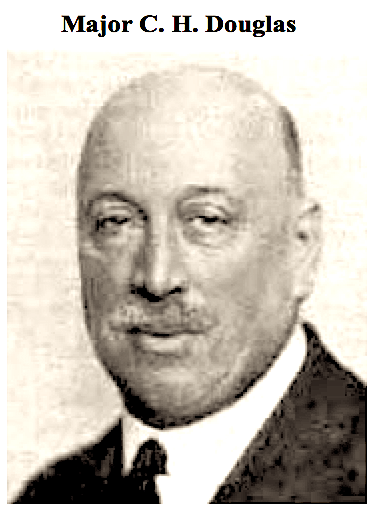 Douglas’s first book, Economic Democracy, was published in 1920, shortly after his article The Delusion of Super-Production appeared in 1918 in the English Review. Among Douglas’s other early works were The Control and Distribution of Production, Credit-Power and Democracy, Warning Democracy and The Monopoly of Credit. Of considerable interest is the evidence he presented to the Canadian House of Commons Select Committee on Banking and Commerce in 1923, to the British Parliamentary Macmillan Committee on Finance and Industry in 1930, which included exchanges with economist John Maynard Keynes, and to the Agricultural Committee of the Alberta Legislature in 1934 during the term of the United Farmers of Alberta Government in that Canadian province. In early years of the movement, Labour Party leadership resisted pressure from Trade unionists to implement Social Credit, as hierarchical views of Fabian socialism, state-socialism, economic growth and full employment, were incompatible with the NationalDividend and abolishment of wage slavery suggested by Douglas. In an effort to discredit the Social Credit movement, one leading Fabian, Sidney Webb, is said to have declared that he didn’t care whether Douglas was technically correct or not – they simply did not like his policy. In 1935 the first “Social Credit” government was elected in Alberta, Canada under the leadership of William Aberhart. A book by Maurice Colbourne entitled The Meaning of Social Credit convinced Aberhart that the theories of C.H. Douglas were essential forAlberta’s recovery from the Great Depression. Aberhart added a heavy dose of fundamentalist Christianity to Douglas’ theories; the Canadian social credit movement, which was largely nurtured in Alberta, thus acquired a strong social conservative tint that it retains to this day. Having counselled the previous United Farmers of Alberta provincial government, Douglas became an advisor to Aberhart, but withdrew shortly after due to strategic differences. Aberhart sought orthodox counsel with respect to the Province’s finances, and the strained correspondence between them was published by Douglas in his book, The Alberta Experiment. Under Ernest Manning, who succeeded Aberhart after his untimely death, the Alberta Social Credit Party gradually departed from its origins and became popularly identified as a right wing populist movement. In the Secretariat’s journal, An Act for the BetterManagement of the Credit of Alberta, Douglas published a critical analysis of the Social Credit movement in Alberta, in which he said, “The Manning administration is no more a Social Credit administration than the British government is Labour”. Manning accused Douglas and his followers of anti-Semitism, and went about purging all of the so called “Douglasites” from the Party. The British Columbia Social Credit Party won power in 1952 in the province to Alberta’s west, but had little in common with Douglas or his theories. Social Credit Parties also enjoyed some national electoral success in Canada. The Social Credit Party of Canada was founded with support from Western Canada, and eventually built another base of support in Quebec. Social Credit also did well at the national level in New Zealand, where it was the country’s third party for almost 30 years. Douglas described Social Credit as “the policy of a philosophy”, and warned against viewing it solely as a scheme for monetary reform. He coined this philosophy “practical Christianity” – the central issue of which is the Incarnation. Douglas believed there was a Canon which ran through the universe, and Jesus Christ was the Incarnation of this Canon. However, he also believed Christianity remained ineffective so long as it remained transcendental. Religion, which derives from the Latin word religare (to “bind back”), was intended to be a binding back to reality. Social Credit is concerned with the incarnation of Christian principles in our organic affairs. Specifically, it is concerned with the principles of association and how to maximize the increments of association which redound to satisfaction of the individual in society – while minimizing any decrements of association. The goal of Social Credit is tomaximize immanent sovereignty. Social Credit is consonant with the Christian doctrine of Salvation through unearned Grace, and is therefore incompatible with any variant of the doctrine of salvation through works. Works need not be of Purity in intent or of desirable consequence and in themselves alone are as “filthy rags”. For instance, the present system makes destructive, obscenely wasteful wars a virtual certainty—which provides lots of “work” for everyone. Social Credit has been called the Third Alternative to the futile Left-Right Duality. Although Douglas defined Social Credit as a philosophy with Christian roots, he did not envision a Christian theocracy. Douglas did not believe that religion should be thrust upon anyone through force of law or external compulsion. Practical Christian society is Trinitarian in structure, based upon a constitution where the constitution is an organism changing in relation to our knowledge of the nature of the universe. “The progress of human society is best measured by the extent of its creative ability. Imbued with a number of natural gifts, notably reason, memory, understanding and free will, man has learned gradually to master the secrets of nature, and to build for himself a world wherein lie the potentialities of peace, security, liberty and abundance.” Douglas said that Social Crediters want to build a new civilization based upon absolute economic security for the individual—where “…they shall sit every man under his vine and under his fig tree; and none shall make them afraid.” In keeping with this goal, Douglas was opposed to all forms of taxation on real property. This set Social Credit at variance from the land-taxing recommendations of Henry George. Social Credit society recognizes the fact that the relationship between man and God is unique. In this view, it is essential to allow man the greatest possible freedom in order to pursue this relationship. Douglas defined freedom as the ability to choose and refuse one thing at a time, and to contract out of unsatifactory associations. If people are given the economic security and leisure achievable in the context of a Social Credit dispensation, Douglas believed most would end their service to mammon and use their free time pursuing spiritual, intellectual, or cultural goals leading to self-development. Douglas opposed what he termed “the pyramid of power”. Totalitarianism reflects this pyramid and is the antithesis of Social Credit. It turns the government into an end instead of a means, and the individual into a means instead of an end—Demon est deus inversus — “the devil is God upside down.” Social Credit is designed to give the individual the maximum freedom allowable given the need for association in economic, political and social matters. Social Credit elevates the importance of the individual and holds that all institutions exist to serve the individual – that the State exists to serve its citizens, not that individuals exist to serve the State. Douglas divided philosophy into two schools of thought that he labeled the “classical school” and the “modern school”, which are broadly represented by philosophies of Aristotle and Francis Bacon respectively. Douglas was critical of both schools of thought, but believed that “the truth lies in appreciation of the fact that neither conception is useful without the other”. Social Crediters, and Douglas himself, have been criticized for spreading anti-semitism. Douglas was critical of “international Jewry”, especially in his later writings. He asserted that some Jews controlled many of major banks and were involved in an international conspiracy to centralize the power of finance. Some people have claimed that Douglas was anti-Semitic because he was quite critical of Jewish philosophy. As lack of finance has been a constant impediment to the development of the arts and literature, the concept of economic democracy through Social Credit had immediate appeal in literary circles. Names associated with Social Credit include Charlie Chaplin, William Carlos Williams, Ezra Pound, T. S. Eliot, Herbert Read, Aldous Huxley, Storm Jameson, Eimar O’Duffy, Sybil Thorndyke, Bonamy Dobrée, Eric de Maré and the American publisher James Laughlin. In 1933 Eimar O’Duffy published Asses in Clover, a science fiction fantasy exploration of Social Credit themes. His Social Credit economics book Life and Money: Being a Critical Examination of the Principles and Practice of Orthodox Economics with A Practical Scheme to End the Muddle it has made of our Civilisation, was endorsed by Douglas. Robert A. Heinlein described a Social Credit economy in his first novel, For Us, The Living: A Comedy of Customs, and his Beyond This Horizon describes a similar system in less detail. In Heinlein’s future society, government is not funded by taxation. Instead, government controls the currency and prevents inflation by providing a price rebate to participating business and a guaranteed income to every citizen. In his novel The Trick Top Hat, part of his Schrödinger’s Cat Trilogy, Robert Anton Wilson described the implementation by the President of an alternate future United States of an altered form of Social Credit, in which the government issues a National Dividend to all citizens in the form of “trade aids,” which can be spent like money but which cannot be lent at interest (in order to mollify the banking industry) and which eventually expire (to prevent inflation and hoarding). More recently, Richard C. Cook, an analyst for the U.S. Civil Service Commission, Food and Drug Administration, NASA, the U.S. Treasury Department, and author of the books Challenger Revealed and We Hold These Truths, has written several articles relating to Social Credit and monetary reform at Global Research, an independent research and media group of writers, scholars, journalists and activists. Frances Hutchinson, Chairperson of the Social Credit Secretariat, has co-authored, with Brian Burkitt, a book entitled The Political Economy of Social Credit and Guild Socialism. ^ Douglas, C.H. (1974). Economic Democracy, Fifth Authorised Edition. Epsom, Surrey, England: Bloomfield Books. pp. 18. ISBN 0904656063. Retrieved 12-11-2008. ^ a b c d e f g Douglas, C.H. (1933 publisher=The Social Credit Press). Credit-Power and Democracy. Melbourne, Australia. pp. 4, 108. Retrieved 12-11-2008. ^ Keynes, John M. (1936 publisher=MacMillan & Co Ltd.). The General Theory of Employment, Interest and Money. London, England. pp. 32, 98–100, 370–371. ^ Chris Giles in London, Ralph Atkins in Frankfurt and,Krishna Guha in Washington. “The Undeniable Shift to Keynes”. The Financial Times. Retrieved 2009-04-11. ^ Cook, Richard C. “C.H. Douglas: Pioneer of Monetary Reform”. Global Research. Retrieved April 11, 2009. ^ Douglas, C.H. (January 22, 1934). “The Monopolistic Idea” address at Melbourne Town Hall, Australia. The Australian League of Rights: Melbourne. Retrieved on February 28, 2008. ^ Douglas, C.H. (1974). Economic Democracy, Fifth Authorised Edition. Epsom, Surrey, England: Bloomfield Books. pp. 74. ISBN 0904656063. Retrieved 12-11-2008. ^ C.H. Douglas. “Warning Democracy”. Australian League of Rights. Retrieved 2008-12-18. ^ C.H. Douglas. “The Working of the Money System”. Social Credit. Mondo Politico. Retrieved 2008-02-27. ^ “The Bank in Brief: Canada’s Money Supply”. Bank of Canada. Retrieved 2008-02-28. ^ a b Douglas, C.H. (February 13, 1934). “The Use of Money” address at St. James’ Theatre, Christchurch, New Zealand. The Australian League of Rights: Melbourne. Retrieved on February 28, 2008. ^ Douglas, C.H. (1973 publisher=Gordon Press). Social Credit. New York. pp. 47. ^ C.H. Douglas. [http://douglassocialcredit.com/resources/resources/possible_social_credit_in_alberta.pdf “FIRST INTERIM REPORT ON THE POSSIBILITIES OF THE APPLICATION OF SOCIAL CREDIT PRINCIPLES TO THE PROVINCE OF ALBERTA”] (PDF). Social Credit Secretariat. Retrieved 2008-12-18. ^ Douglas, C.H. (November 24, 1936). “Dictatorship by Taxation” address at Ulster Hall, Belfast. The Australian: Melbourne. Retrieved on February 28, 2008. ^ Douglas, C.H.. The New and the Old Economics. Sydney, n.d.. ISBN 0858550040. ^ a b C.H. Douglas (December 1918). “The Delusion of Superproduction” (PDF). The Delusion of Superproduction. The English Review. Retrieved 2008-12-11. ^ Pullen, J. M.; G. 0. Smith (1997). “Major Douglas and Social Credit: A Reappraisal”. Duke University Press. pp. 219. ^ “The Alberta Post-War Reconstruction Committee Report of the Subcommittee on Finance”. Simple Text. Retrieved 2008-03-01. ^ C.H. Douglas. “The Nature of Democracy”. Australian League of Rights. Retrieved 2008-04-13. ^ a b c d C.H. Douglas. “Realistic Constitutionalism”. Australian League of Rights. Retrieved 2008-02-28. ^ Douglas, C.H. (March 7, 1936). “The Approach to Reality“ address at Westminster. Australian League of Rights: Melbourne. Retrieved on February 28, 2008. ^ Douglas, C.H. (October 30, 1936). “The Tragedy of Human Effort” address at Central Hall, Liverpool. Australian League of Rights: Melbourne. Retrieved on 2008-02-28. ^ “Select Committee on Banking and Commerce” (PDF). 1923. Retrieved 2008-12-11. ^ Lee, Jeremy (July, 1972). “C.H. Douglas The Man and the Vision”. Australian League of Rights. p. 6. ^ Douglas, C.H. (1937). The Alberta Experiment. London: Eyre and Spottiswoode. ^ a b Douglas, C.H. (July 28, 1932). “The Fallacy of a Balanced Budget”. The New English Weekly. pp. 346–7. ^ Glenbow Museum. “Prosperity Certificate”. Glenbow Museum. Retrieved 2008-02-27. ^ C.H. Douglas. “The Approach to Reality”. The Australian League of Rights. Retrieved 2008-02-27. ^ C.H. Douglas. “The Policy of a Philosophy”. Australian League of Rights. Retrieved 2008-03-01. ^ C.H. Douglas. “Brief for the Prosecution”. Veritas Publishing Co. Pty, Ltd.
^ E. S. Holter (1978). The ABC of Social Credit. Vancouver: Institute of Economic Democracy, Sixth Printing, Dec.1978. ISBN 0920392245. ^ Munson, Gorham (1945). Aladdin’s Lamp: The Wealth of the American People. New York: Creative Age Press. ^ Monahan, Bryan (1971). Why I am a Social Crediter. Sydney: Tidal Publications. pp. 3. ISBN 0858550016. ^ “The Use of Social Credit”. ^ Monahan, Bryan (1971). Why I am a Social Crediter. Tidal Publications. pp. 7. ISBN 0858550016. ^ Douglas, C.H. (1920). Economic Democracy. Melbourne: Heritage for Institute of Economic Democracy. pp. 33. ISBN 0904656004. ^ C.H. Douglas. “Brief for the Prosectution”. Retrieved 2009-03-29. ^ C.H. Douglas. “Static and Dynamic Sociology”. Social Credit. Mondo Politico. Retrieved 2008-03-01. ^ Douglas, C.H. (1973 publisher=Gordon Press). Social Credit. New York. pp. 22. ^ a b Finlay, John L (1972 publisher=McGill-Queen’s Univ. Press). Social Credit: The English Origins. Montreal: McGill-Queens University Press. pp. 105. ISBN 9780773501119. ^ Stingel, Janine (2000). Social Discredit: Anti-Semitism, Social Credit and the Jewish Response. Montreal: McGill-Queen’s University Press. p. 13. ^ Hutchinson, Frances (1997). Political Economy of Social Credit and Guild Socialism. UK: Routledge. ISBN 9780415147095.